With this being only the second visit of the new school year and this year's class being a little on the young side and still settling in, I knew I wanted to keep this storytime a little shorter and be sure to pick books and activities that would be highly engaging. I didn't really have anything in mind, but after a child at one of the other daycares excitedly described the book he received from our summer reading program, Count The Monkeys, I've been wanting to do it again because it's so much fun. Then yesterday one of our face-outs on the shelf that I've used before and has a monkey as the main character happened to catch my eye. I thought of how most kids already know and enjoy "Five Little Monkeys Swinging In A Tree" and "Five Little Monkeys Jumping on a Bed", and decided that was the way to go. We started off with our welcome song, and then I introduced the topic by showing them the monkey fingerpuppets I had based on Eileen Christelow's Five Little Monkeys Jumping On The Bed. I asked the kids what the monkeys were wearing, and it took some coaxing to get them to say pajamas. Then I asked what they thought the monkeys were doing, and most of them said "jumping on the bed!" and one boy even added "if you jump on the bed, you'll fall and bump your head!". So then we did the rhyme with me using the finger puppets and the kids just holding up their fingers. Five little monkeys, jumping on the bed. One fell off and bumped his(her) head. 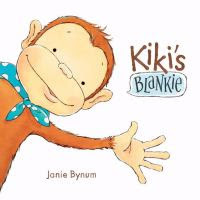 After that we sang our story song and read our first book, Kiki's Blankie by Janie Bynum. This is a short, simple story that I like for several reasons. First, most children can relate to having a blankie or other favorite possession that they are attached to. Second, I like that it promotes using your imagination as Kiki uses her blankie as a tent, pirate's head scarf, cowgirl's bandana, superhero's cape, and more as she engages in pretend play. Also, it has a little bit of mild drama involving a crocodile, which ties into our next activity, and shows Kiki being brave even without her blankie and engaging in creative problem-solving. Next, we did another favorite of most kids, "Five Little Monkeys Swinging In A Tree". I interchange alligator and crocodile in this rhyme, depending on the stories I've selected for that day. I used my velcro set of monkeys and crocodile with a storytelling glove pictured below, but I've decided that I prefer just using my hands and fingers, so I can really give a loud clap on the "Snapped that monkey right out of the tree" part. "Five Little Monkeys Swinging In A Tree"
Five little monkeys, swinging in a tree. Teasing Mr. Crocodile, "You can't catch me!" And SNAPPED that monkey right out of the tree! 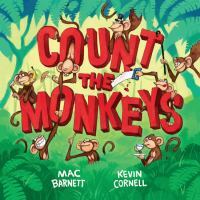 I saved our most lively book for last, Count The Monkeys by Mac Barnett. This book is fun, silly, involves counting, and is highly interactive. It starts by directing the audience to turn the page to start counting the monkeys. But, when you turn the page, instead of monkeys we find a big king cobra! The book directs us to quietly and slowly turn the page, where we discover two mongooses (mongeese? mongooses? Let's take a vote!) have scared the snake away. We keep turning the page hoping to find monkeys, but instead find many other scary or silly things. Sadly, we get to the last page without ever having seen a single monkey. But, wait! What's that on the endpapers!? Then we finished up with our closing song and passing out stickers. This turned out to be a great storytime. The kids liked Kiki's Blankie, but they LOVED Count The Monkeys! This book is so much fun! If it's not in your storytime collection, I highly recommend you add it, which reminds me that I really need to buy a copy for my own personal collection. The kids loved being suprised by the snake, and looked forward to seeing what would come next, acted out the instructions, and loved the shear silliness of it. The ones who caught a glimpse of the monkeys on the endpaper as I closed the book, disappointed we never got to count any monkeys, were SO excited to tell me they were there. As expected, many knew the two rhymes, and they all enjoyed them, giggling as each monkey finger puppet was tossed into the floor, bumping his/her head, and snapping the crocodile's jaws to catch the monkey in the tree. While I hear many teachers, librarians, and other early literacy providers say they get sick of all the "five little...." and "ten little...." fingerplays and songs, I don't mind them. The kids really seem to enjoy them, and while they may already know how to count from 1 to 10, I really like using them to work their fine motor skills (especially if you also count down, and have them use the non-dominant hand the second time). Not to make it all about me, but I really needed this storytime today. I woke up in a particularly gloomy mood thanks to not sleeping well, stress at home (hence the not sleeping well), and the miserable rainy weather thanks to hurricane Harvey. I had the hardest time getting up and moving, but I knew if I pushed through that storytime would lift my spirits, and it did. The kids listened well and had so much fun, and are just so darn cute; it's impossible to stay gloomy in storytime 😀. Davy Jones was such a cutie; hard to believe he's gone.